Weekly variety extravaganza from the illustrious West End venue. By the time of its 100th performance was transmitted on 2 March 1958, only 4 editions of Sunday Night at the London Palladium run had failed to make the Top 10 most popular programmes, making it something of a national institution, and one of the foundation stones of successful commercial television in the UK. The brainchild of Val Parnell , its format was that of a compered variety bill, with the added injection of an occasional bit of 'high' culture to counterbalance the mini-game show, 'Beat The Clock'. The familiar theme tune overtured a typical show consisting of an opening dance chorus routine, often from the Tiller Girls, followed by a speciality or novelty act (acrobats, tumblers, mimes, puppets), and an act to close the first half, usually new or up and coming. Beat The Clock made up the middle section, and the star act would have most of the final segment, with the finale on the revolving stage while the credits rolled. Acts were sometimes booked to take advantage of their being in London on tour, so many international stars appeared alongside home-grown talent. 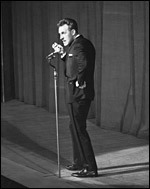 The orchestra and audience were seen often during the show to build atmosphere, and the compere - with catchphrase - generally got his chance to perform or join in. Over time, the balance of acts inevitably shifted from those drawn from music hall, variety or radio to include those from television and pop music, the growth of which market almost paralleled the arrival of commercial TV. Coming as it did from one of Britain's most prestigious theatres, Sunday Night grabbed the attention of audiences and made them feel part of the event - a night out - without leaving their front room. For many, the only comparable event was the annual Royal Variety Show , itself often held at the Palladium. The show, fully networked from its early days, took a holiday break for the summer (no doubt enabling the traditional seaside Summer Shows to keep an audience), and a brief Christmas break, but by 1965 was already being seen as "an oxygen tent for vaudeville". Although periodically revived with some format changes, its heyday ended more or less as Parnell 's involvement ceased, while greater viewing and listening choices emerged to erode its audience share.